This report provides a detailed summary of call activity for any extension user in the phone system. See aggregate call volume and how calls were handled at the level of every user, regardless of how the call arrived at the user's extension. Using this report, you can track the number of answered, abandoned, and missed calls for each user, and supervise employee productivity. You can sort data by the total number of calls handled and view users that have been busy handling calls. If you are tracking call activity based on phone numbers, you should check the Calls by DID dashboard. Let's say that John answered 10 calls dialed directly to his extension, five calls directed from a ring group that John is a member of, two calls from an auto attendant, and three calls from a call queue that he is a member of, bringing him up to a total of 20 answered calls. Whether or not the calls were dialed directly to John's extension or routed via other services, all calls ultimately arrived at John's extension. In the Extension Summary report, you can get data in tabular format, as well as look at the visual charts for a quick analysis. 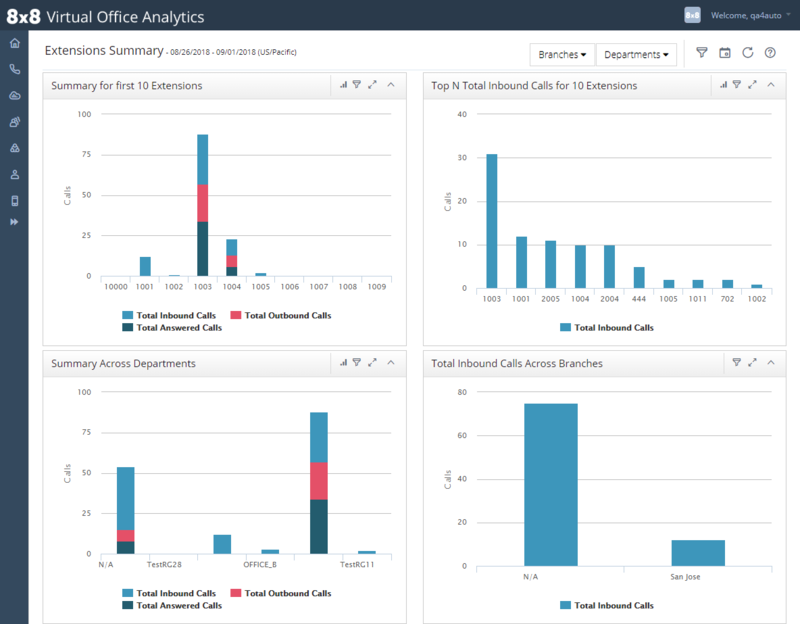 The following four charts in Extension Summary provide a quick look at the call activity of an extension to a department. Summary for first (#) employees: You can select the number of extensions under the selected branch(es) and department(s), and view the summary of extension call activity for selected metrics (total inbound, total outbound, total missed, total abandoned, and total answered). 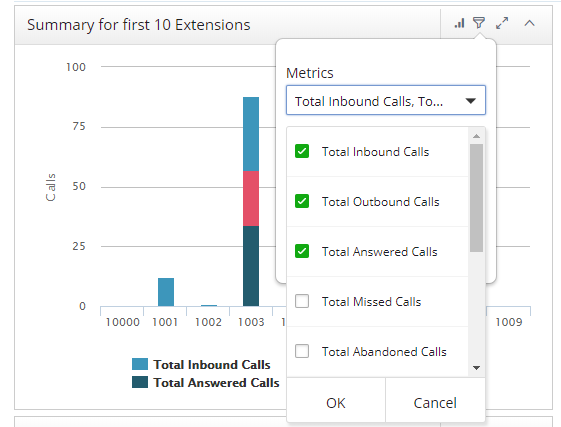 Top (#) <selected metric> for (##) extensions: In this chart, you can select a metric (such as Total Inbound Answered), and view the extensions which answered the most inbound calls in the time frame selected. The stats are displayed in descending order by extension. For example, a Sales manager can now identify their star performers by looking at the extensions that answered the most inbound calls. 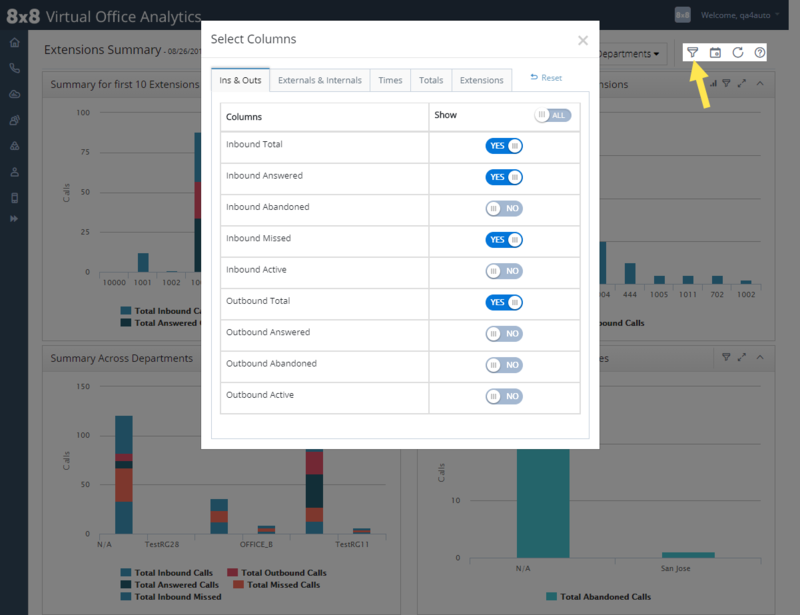 Summary across Departments: You can select multiple departments and see a summary chart that compares selected metrics (total inbound, total outbound, total missed, total abandoned, and total answered) across departments. 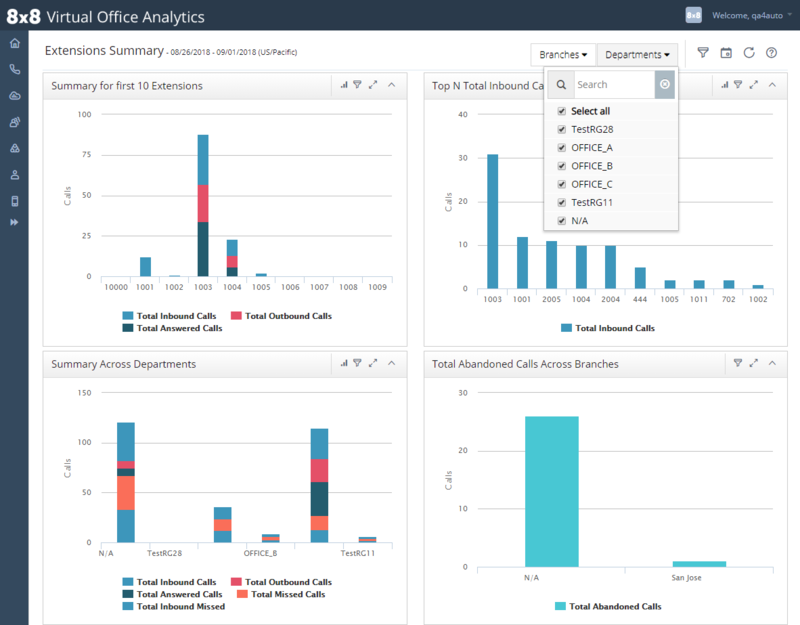 Total <selected metric> across Branches: You can view the call metrics of each branch,including the total number of calls received, answered, abandoned, and missed, as well as outbound metrics. From the filter, select one key metric at a time to view data for all branches. You can simplify the metrics in this dashboard by focusing on the key metrics. 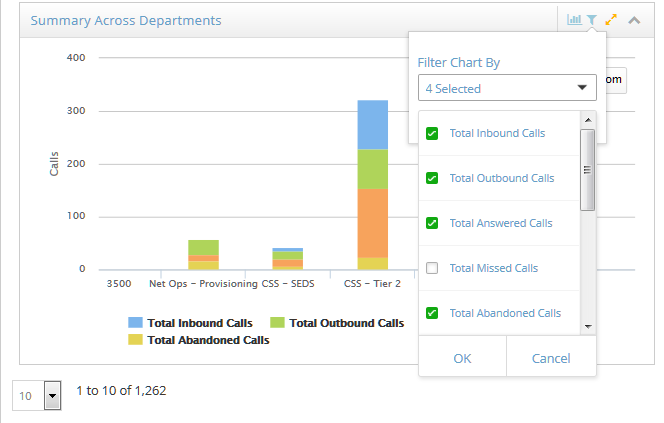 The simplified dashboard shows a summarized version of the metrics, and eliminates "total abandoned" metrics and "total time" metrics such as total call time, total ring time, and total talk time. In the upper-right corner of the Company Summary and Extension Summary dashboards, click the drop down menu next to your name and select Configuration. Enable Toggle Simplified UI. By default, the simplified UI is disabled. At the prompt, confirm to update. Note: Please note that this toggle impacts all users viewing Virtual Office Analytics for this phone system. Check with your administrator before changing this setting. You can filter and customize the report to extract the data you need. The extension summary report can be customized to extract data for a specific day, week, month, or year. Click and select the desired time period. From the table, select the desired metrics. The data columns are grouped into the relevant categories for convenience. The report refreshes the view. Click the Branch drop down menu and select a desired branch. In addition, you can select departments within the branch office. Note: Filters created on the page are carried over when user exports the report. Ins and Outs: Cumulative metrics of external and internal call activity. Externals and Internals: Tracks call activity of extensions with numbers outside of the phone system and with other extensions. Times: Tracks metrics on ringing time, abandoned time, or talk time of calls directed to or handled by extensions. 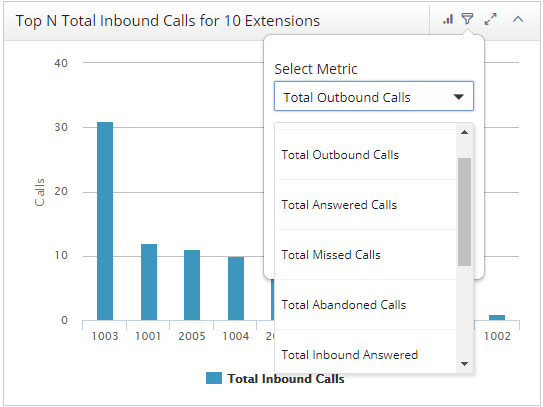 Totals: Track cumulative metrics (inbound and outbound) on the total number of answered, abandoned, missed, and active calls. Extensions: Access extension details such as extension number, first name, last name, branch, and department of the extension user. You can download a report as an Excel file. Calls from/to numbers outside (External) and within the phone system (Internal). Inbound Total Total number of calls (external and internal) received by the extension. Inbound Answered Total number of incoming calls (external and internal) answered live by the extension. This excludes calls answered by voicemail or by an auto attendant. Inbound Abandoned Total number of calls abandoned by callers before being answered by a live person or before reaching voicemail (such as missed calls, minus calls that reached voicemail). Inbound Missed Total number of calls that were not answered live (calls that reached voicemail, plus calls that were abandoned). Inbound Active Total number of inbound calls in progress at the time of this report. The value is zero, one, or two. Outbound Total Total number of calls placed from an extension. Outbound Answered Total number of outbound calls dialed from the extension that were connected at the destination. This includes calls answered by a live person, auto attendant, voicemail, and so on. Outbound Abandoned Total number of outbound calls that never connected to the external system. For example, calls that ring with no answer. Outbound Active Total number of outbound calls in progress from this extension at the time of the report. The value is zero, one, or two. Externals: Calls from/to numbers outside the PBXPrivate Branch Exchange—a private telephone network used within a company.. External Inbound Total Total number of direct calls received by the extension from outside the phone system. This excludes calls from other extensions, and external calls that went through an auto attendant or ring group before alerting the extension. External Inbound Answered Total number of incoming calls answered live. This excludes calls answered by voicemail or by an auto attendant. External Inbound Answered Percentage The percentage of inbound calls from an external caller handled by extension users. External Inbound Missed Total number of calls that were not answered live (calls that reached voicemail, plus calls that were abandoned). External Inbound Active Total number of inbound calls in progress at the time of the report. The value is zero, one, or two. External Outbound Total Total number of calls placed from an extension to an external number. External Outbound Answered Total number of outbound calls dialed from the extension that were answered at the destination. This includes calls answered by a live person, auto attendant, voicemail, and so on. External Outbound Answered Percentage The percentage of outbound calls to an external number handled by extension users. External Outbound Active Total number of outbound calls in progress from this extension at the time of the report. The value is zero, one, or two. Internal Inbound Total Total number of calls received by the extension from within the phone system. This excludes calls received from outside the phone system. Internal Inbound Answered Total number of incoming calls answered live. This excludes calls answered by voicemail or auto attendant. Internal Inbound Abandoned Total number of incoming calls abandoned by callers before being answered by a live person or before reaching voicemail (missed calls, minus calls that reached voicemail). Internal Inbound Missed Total number of calls that were not answered live (calls that reached voicemail, plus calls that were abandoned). Internal Inbound Active Total number of inbound calls in progress at the time of the report. The value is zero, one, or two. Internal Outbound Total Total number of calls placed from the extension to other extensions. Internal Outbound Answered Total number of outbound calls dialed from the extension that were answered at the destination. This includes calls answered by a live person, auto attendant, voicemail, and so on. Internal Outbound Abandoned Total number of calls abandoned by callers before being answered by a live person or before reaching voicemail (missed calls, minus calls that reached voicemail). Internal Outbound Active Total number of outbound calls in progress from this extension at the time of the report. The value is zero, one, or two. Ring Time Cumulative duration of ringing before answering incoming calls. Avg Ring Time Average duration of ringing before answering incoming calls. Talk Time Cumulative duration of the talk time of all successful calls from the time of connection to termination (includes the hold time). Abandoned Time Cumulative duration of all abandoned calls to this extension (all calls where the caller ends the call before being answered). Includes extension-to-extension activity. Avg Abandoned Time Average length of calls that are abandoned including extension-to-extension calls. Total Answered Total number of incoming calls answered live by the extension, plus the total number of outbound calls dialed from the extension that were answered at the destination. This excludes calls answered by voicemail or auto attendant. Total Abandoned Cumulative total calls abandoned by callers before being answered by the extension user or before reaching voicemail (missed calls, minus calls that reached voicemail), plus the total number of outbound calls abandoned by the extension user before being answered by the destination party. Total Missed Total number of inbound calls that were not answered live by the extension (calls that reached voicemail, plus calls that were abandoned), plus the total number of outbound calls abandoned by the extension user. Total Active Total number of inbound and outbound calls in progress at the time of the report. The value is zero, one, or two. Total VMVoicemail is a voice message that a caller leaves when the person called cannot be reached. Calls Total number of incoming calls that reached voicemail. Extension The user extension number. First Name The first name of the user assigned to the extension. Last Name The last name of the user assigned to the extension. Department The department of the extension user. Branch The branch office of the extension user. PBX Name The name of the phone system.